Description and implementation of the computation of the minimum spanning tree using Prim's algorithm and Scala tail recursion. Finding the optimum arrangement to connect nodes is a common problem in Network design, transportation projects or electrical wiring. Each connectivity is usually defined as a weight (cost, length, time...). The purpose is to compute the schema that connects all the nodes that minimize the total weight. This problem is known as the minimum spanning tree or MST related to the nodes connected through an un-directed graph. Several algorithms have been developed over the last 70 years to extract the MST from a graph. This post focuses on the implementation of the Prim algorithm in Scala. The Prim's algorithm can be easily expressed as a simple iterative process. It consists of using a priority queue of all the vertices in the graph and update their load to select the next node in the spanning tree. Each node are popped up (and removed) from the priority queue before being inserted in the tree. In most case, the identifier is a characters string or a data structure. As described in the pseudo-code, the load for the root of the spanning tree is defined a 0. The load is defined as an integer for performance's sake. It is recommended to convert (quantization) a floating point value to an integer for the processing of very large graph, then convert back to a original format on the resulting minimum spanning tree. The edges are defined as hash table with the source vertex as key and the hash table of destination vertex and edge weight as value. The graph is un-directed therefore the connection initialized in the method += are bi-directional. The priority queue is used to reordered the vertices and select the next vertex to be added to the spanning tree. Note: There are many different implementation of priority queues in Scala and Java. You need to keep in mind that the Prim's algorithm requires the queue to be reordered after its load is updated (see pseudo-code). The PriorityQueue classes in the Scala and Java libraries do not allow elements to be removed or to be explicitly re-ordered. An alternative is to used a binary tree, red-black tree for which elements can be removed and the tree re-balanced. The implementation of the priority has a impact on the time complexity of the algorithm. The following implementation of the priority queue is provided only to illustrate the Prim's algorithm. The Scala PriorityQueue class required the implicit ordering of vertices using their load (line 2). This accomplished by defining an implicit conversion of a type T with upper-bound type Vertex to Ordering[T] (line 12). Note: The type T has to be a sub-class of Vertex. A direct conversion from Vertex type to Ordering[Vertex] is not allowed in Scala. We use the PriorityQueue from the Java library as it provides more flexibility than the Scala TreeSet. As long as the priority queue is not empty (line 6), the next element is the priority queue is retrieved (line 7) for which is select the most appropriate candidate for the next vertex (line 8 - 11). The load of each candidates is updated (line 14) and the priority queue is re-sorted (line 15). Note: Although a tree set is more efficient to manage the vertices waiting to be weighted, it does not allow resorted the existing priority queue (immutability). Note: See Summary of time complexity of algorithms for details. 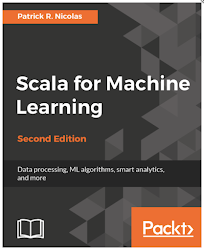 Really appreciated the information and please keep sharing, I would like to share some information regarding online training.Maxmunus Solutions is providing the best quality of this Apache Spark and Scala programming language. and the training will be online and very convenient for the learner.This course gives you the knowledge you need to achieve success. For Joining online training batches please feel free to call or email us. CCIE training course in Noida.